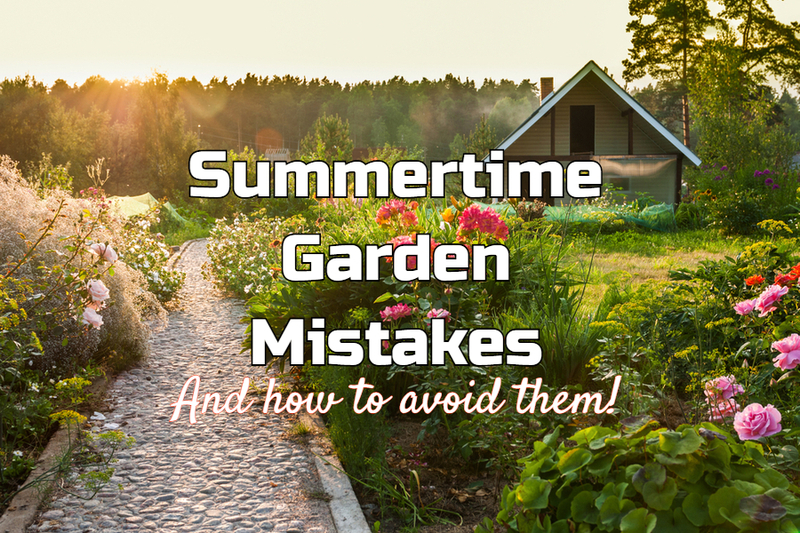 Some of the most common garden mistakes and landscaping miscues occur during the middle of summer. Summertime is great time to enjoy the outdoors. Unfortunately, all of that enjoying sometimes leads to a few forgotten chores. As much as gardeners worry about getting things “just right” in the spring, or putting their yard and garden to bed properly in the fall – summer seems to be a time where things can get a little lax. Here are 5 of the most common summertime landscape and garden mistakes, and how to avoid them to keep your plants and landscape thriving. Letting weeds like this dandelion go to seed can create hundreds of more weeds next year. Although weeding is hardly anyone’s favorite chore, by summer, many gardeners have finally had their fill of digging and pulling pesky weeds. But when weeds are left to grow too long, they can quickly go to seed. And that is when problems multiply. Allowing weeds to grow long enough to form a seed head is one of the biggest garden mistakes made. A single dandelion head can contain from 50 to 150 seeds. And that can multiply your dandelion weed problems by 50 to 100 times. So stay at those weeding chores. If all else fails, at lease cut or trim down existing weeds down before they mature enough to grow more seed. See : How To Keep Weeds At Bay For Good! If you want your annual and perennial flowers to keep blooming or bloom longer, then pinching off dead or dying blooms is a must! Keep picking off old blooms to keep new coming on! Pinching off spent blooms from annual and perennial flowers allows plants to focus their energy on producing new blooms. As you walk your landscape every few days, continue to remove any dead or dying blooms from hanging baskets, containers, and perennials in your flowerbeds. You will be amazed at the results, and rewarded with more blooms and color. As a gardener, creating a compost pile is one of the best things you can do. Good compost can bring life and vitality to gardens, flowers, trees and more. But not when it contains hundreds of thousands of seeds, or even worse, disease. Only compost materials that have not been damaged by blight or disease. In addition, resists putting in rotting vegetables or scraps from the kitchen that contain huge seed pods. Most home compost piles simply don’t get hot enough to kill weed seeds or pathogens. So if you compost bad material or seeds – you are likely to create more problems than the compost is worth! Before putting vegetable scraps into the pile, always remove the seed cores. If fruit or foliage looks diseased, keep it out of the compost pile. It can keep you from making one of the costliest garden mistakes of all. Although gardeners are quick to notice wilting vegetable plants and flowers, we sometimes forget that shrubs and bushes need water too. Don’t forget to water shrubs, bushes and trees if the weather turns dry! Whether vegetable plants in the garden, perennials in flowerbeds, or shrubs, trees and bushes, be careful of applying too much fertilizer during the hot summer months. For vegetable plants, over-fertilizing can actually lead to less fruiting. Plants use the excess energy to create new stems, branches and foliage, cutting down on new blooms. Too much fertilizer can also be tough on perennials, shrubs and trees. For starters, it runs the risk of burning plants during the hot summer months. In addition, it can create too much late season growth for perennials, shrubs and bushes, leaving them vulnerable to the winter weather ahead. Share your backyard garden or gardening tip on This Is My Garden! Email us today at info@thisismygarden.com, and you could be our next feature! This article may contain affiliate links. Predicting Winter – Myths And Folklore To Tell What’s In Store!